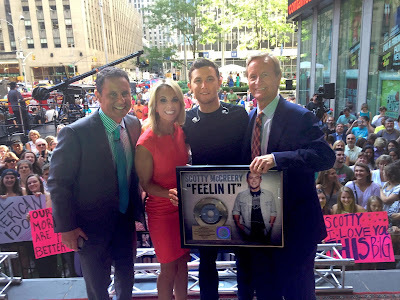 Scotty McCreery debuted his highly anticipated new single “Southern Belle” on “FOX & Friends” All-American Summer Concert Series last Friday. The song, written by Sean McConnell and Jason Saenz, will be available for purchase Aug 24 and impacts radio Sep 7. “Southern Belle” is the first single from McCreery’s upcoming new album due out in early 2016. Watch the “FOX & Friends” performance here. This summer, McCreery is featured in Fandango.com's "I Love Movies" original video series. Watch him talk about his favorite movie, "Miracle," here. He is also on the road throughout the summer, both on his own and as the special guest on the Rascal Flatts RIOT 2015 Tour. Visit ScottyMcCreery.com for tour dates and ticket information. In-between concert dates, the Mercury Nashville / 19 / Interscope recording artist is writing songs as well as working in the studio on his next album with producer Frank Rogers. The ACM, CMT Music, ACA, and ICM Award winner scored two consecutive Top 10 hits (“See You Tonight” and “Feelin’ It”) from his last album See You Tonight, which debuted at No. 1 on the Billboard Top Country Albums chart. It was his third album to debut at No. 1 on a Billboard chart following his Platinum-certified first album Clear As Day, which debuted at No. 1 on the Billboard Top 200 Albums Chart, and his Gold-certified album Christmas with Scotty McCreery, which debuted at No. 1 on the Billboard Top Holiday Albums Chart. For more information and additional tour dates, visit www.scottymccreery.com.